With HackerYou’s new Income Share Agreements, your tuition is just $1 upfront. Graduates pay a percentage of their income after they're hired, but only if they're making at least $50,000 a year. *Pending approval from the Ministry of Training, Colleges and Universities. We are excited to be the first school in Canada to offer Income Share Agreements, pending approval from the Ministry of Training, Colleges and Universities. Our Bootcamp is an intensive nine-week full-time program that changes lives. This immersive learning experience requires hard work, focus, commitment, and absolute dedication. We want to take the financial stress away, so that you can focus on making the most of your experience and become the best developer you can be. 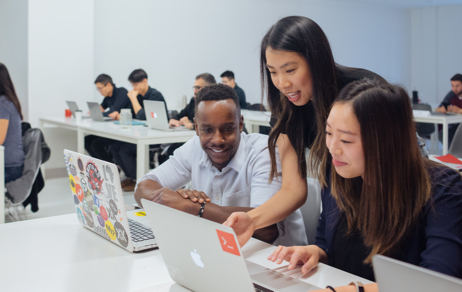 We know that pursuing a career change can be intimidating - but we’re confident that an investment in Bootcamp at HackerYou will pay off. Our graduates wrap up their Bootcamp experience with the skills they need to be ready for a new job, an awesome salary, and a promising career. But don’t just take our word for it - after five years of Bootcamp, the numbers speak for themselves. The Toronto tech industry is growing exponentially - and so is the demand for talented web developers. Income Share Agreements make our Bootcamp an accessible, risk-free investment for every Canadian. Our goal is to bring together a diverse group of students all committed to a career change - regardless of their background or financial circumstances. Since our Bootcamp requires knowledge of HTML, CSS and responsive design, we’re offering $250,000 in need-based scholarships for our part-time beginner courses, the first step on your journey to becoming a developer. Ready to see the numbers behind Income Share Agreements? Download our ISA Breakdown Sheet to see everything you need to know to decide if ISAs are the right choice for your learning journey. 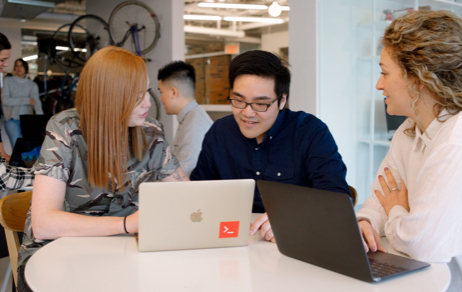 Find out everything you need to know about Income Share Agreements at HackerYou by checking out our FAQ. HackerYou’s Income Share Agreement program is optional. Students may still opt to pay the full tuition up front - this will always be the least expensive option for students! If a student is offered an Income Share Agreement, their upfront tuition is just a loonie. We are required to charge a fee (even if it’s a small one) as a condition of our status as a registered Private Career College. Once graduates land a job making at least $50,000 annually, they pay HackerYou 17% of their income on a monthly basis for 24 months. Payments are capped at $30,000, so a graduate with a high salary isn’t penalized. In any month, if a graduate doesn’t make at least $4166.66 (including if they lose their job or take time off to stay home with kids), payments pause. Regardless of the number of payments a graduate has made, their Income Share Agreement ends after five years. Students are eligible for ISAs if they are a Canadian citizen, legally allowed to work in Canada, and have an approved Canadian bank account. We will begin enrolling students with Income Share Agreements for cohorts starting on and after July 29, 2019, pending approval from the Ministry of Training, Colleges and Universities. Interested in using an Income Share Agreement to launch your career as a Web Developer? Apply to Bootcamp now and a member of our Student Success Team will be in touch to discuss your learning journey. For all press related inquiries, please contact press@hackeryou.com.